Using data from the Hubble Space Telescope, researchers from the University of Chicago have detected clear evidence of clouds in the atmosphere of exoplanet GJ1214b. 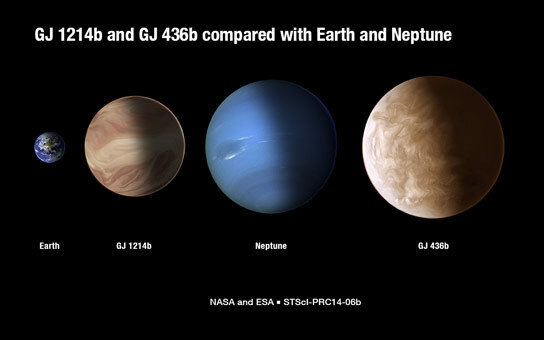 Weather forecasters on exoplanet GJ1214b would have an easy job. Today’s forecast: cloudy. Tomorrow: overcast. Extended outlook: more clouds. A team of scientists led by researchers in the Department of Astronomy and Astrophysics at the University of Chicago report they have definitively characterized the atmosphere of a super-Earth class planet orbiting another star for the first time. The scrutinized planet, which is known as GJ1214b, is classified as a super-Earth type planet because its mass is intermediate between those of Earth and Neptune. 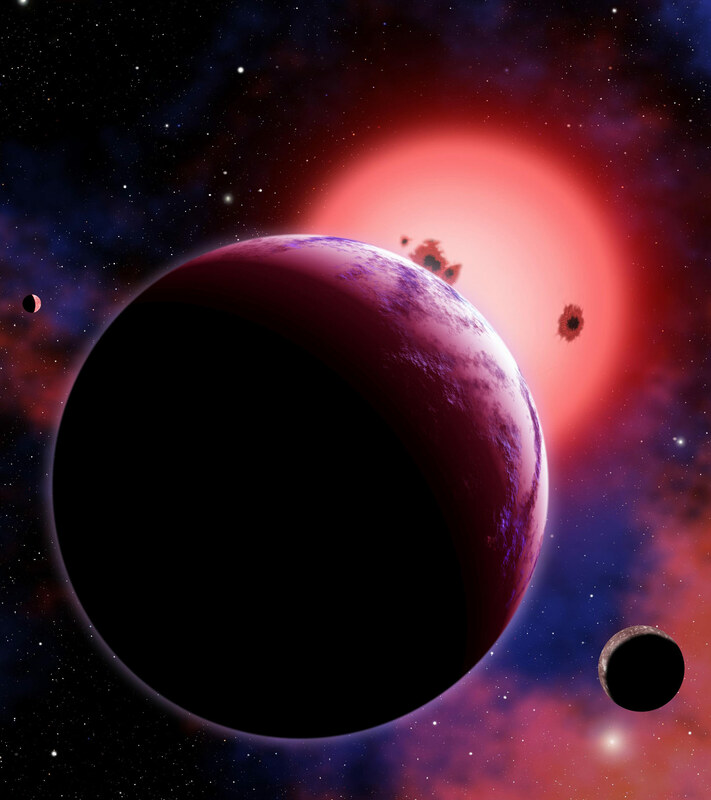 Recent searches for planets around other stars (“exoplanets”) have shown that super-Earths like GJ1214b are among the most common type of planets in the Milky Way galaxy. Because no such planets exist in our Solar System, the physical nature of super-Earths is largely unknown. 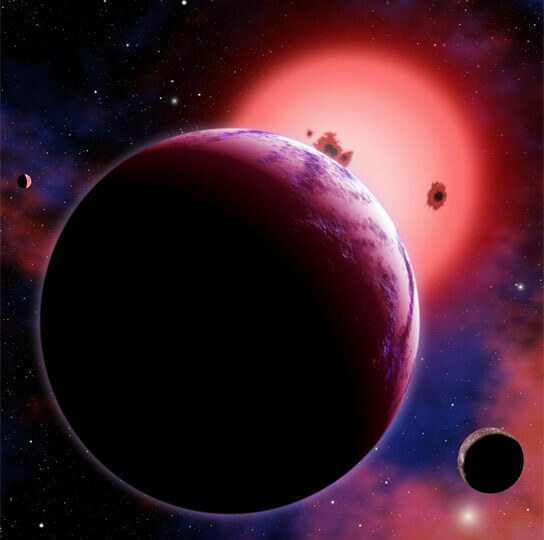 Previous studies of GJ 1214b yielded two possible interpretations of the planet’s atmosphere. Its atmosphere could consist entirely of water vapor or some other type of heavy molecule, or it could contain high-altitude clouds that prevent the observation of what lies underneath. But now a team of astronomers led by University of Chicago’s Laura Kreidberg and Jacob Bean have detected clear evidence of clouds in the atmosphere of GJ1214b from data collected with the Hubble Space Telescope. The Hubble observations used 96 hours of telescope time spread over 11 months. This was the largest Hubble program ever devoted to studying a single exoplanet. The researchers describe their work as an important milestone on the road to identifying potentially habitable, Earth-like planets beyond our Solar System. The results appear in the January 2 issue of the journal Nature. “I think it’s very exciting that we can use a telescope like Hubble that was never designed with this in mind, do these kinds of observations with such exquisite precision, and really nail down some property of a small planet orbiting a distant star,” explained Bean, an assistant professor and the project’s principal investigator. GJ1214b is located just 40 light-years from Earth, in the direction of the constellation Ophiuchus. Because of its proximity to our solar system and the small size of its host star, GJ1214b is the most easily observed super-Earth. It transits, or passes in front of its parent star, every 38 hours, giving scientists an opportunity to study its atmosphere as starlight filters through it. Kreidberg, Bean and their colleagues used Hubble to precisely measure the spectrum of GJ1214b in near-infrared light, finding what they consider definitive evidence of high clouds blanketing the planet. These clouds hide any information about the composition and behavior of the lower atmosphere and surface. The planet was discovered in 2009 by the MEarth Project, which monitors two thousand red dwarf stars for transiting planets. The planet was next targeted for follow-up observations to characterize its atmosphere. The first spectra, which were obtained by Bean in 2010 using a ground-based telescope, suggested that the planet’s atmosphere either was predominantly water vapor or hydrogen-dominated with high-altitude clouds. More precise Hubble observations made in 2012 and 2013 allowed the team to distinguish between these two scenarios. The news is about what they didn’t find. The Hubble spectra revealed no chemical fingerprints whatsoever in the planet’s atmosphere. This allowed the astronomers to rule out cloud-free atmospheres made of water vapor, methane, nitrogen, carbon monoxide, or carbon dioxide. The best explanation for the new data is that there are high-altitude clouds in the atmosphere of the planet, though their composition is unknown. Models of super-Earth atmospheres predict clouds could be made out of potassium chloride or zinc sulfide at the scorching temperatures of 450 degrees Fahrenheit found on GJ1214b. “You would expect very different kinds of clouds to form than you would expect, say, on Earth,” Kreidberg said. Funding from the National Aeronautics and Space Administration, National Science Foundation, Alfred P. Sloan Foundation, and European Research Council. 1 Comment on "Hubble Reveals Cloudy Weather on Exoplanet GJ1214b"
The atmosphere of exoplanet GJ1214b around a red star of 40 light years away is reported to be confined with heavy clouds of not so transparent with H2O, CH4,N2 CO, CO2 and may be NH3. 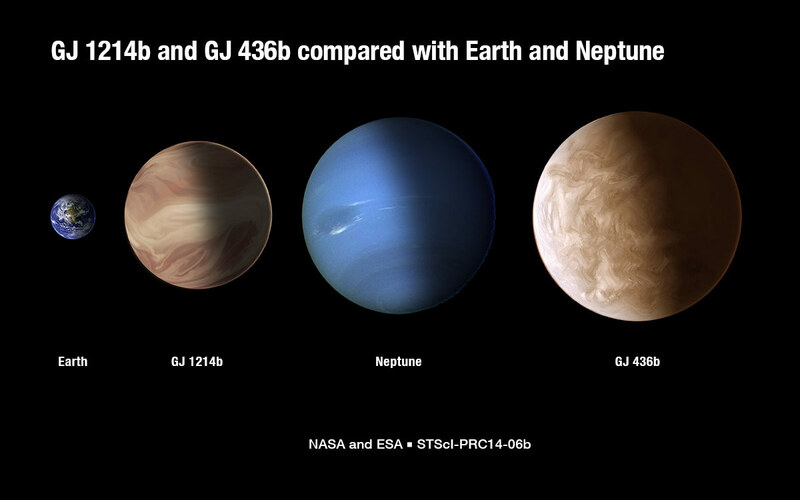 We can compare these large exoplanets with the atmosphere of our giants like Jupiter,Saturn, and Neptune. They are all heavily clouded completely concealing the land and moreover they contain rings of such gases around them along with some planets which are purely terrestrial. Thank You.